Sasseur REIT, which made its debut on SGX today, is the first Outlet Mall REIT to be listed in Asia. It has an initial portfolio of four retail outlet mall properties in the fast-growing cities of Chongqing, Kunming and Hefei in the People’s Republic of China. Entrusted Management Agreement (“EMA”) rental income for Sasseur REIT’s properties grew 48.7% YoY to S$91.2 million for the nine months ended 30 Sept 2017, driven by rent contribution from its Hefei Outlets and Kunming Outlets, which opened in 2016. Including Sasseur REIT, there are now 10 Retail REITs as categorised by GICS®, which make up 23% of the REITs and property trusts listed on SGX. The 10 retail trusts have a combined market capitalisation of S$22.8 billion and average a dividend yield of 6.7% (after including Sasseur REIT’s projected dividend yield of 7.5% for the 2018 forecast period). Sasseur Real Estate Investment Trust (REIT), which made its debut on SGX today, is the first Outlet Mall REIT to be listed in Asia. Sasseur REIT has an initial portfolio of four retail outlet mall properties in the People’s Republic of China, with an aggregate net lettable area of 304,573.1 sq m and an appraised value of approximately RMB 7.34 billion (or S$1.5 billion). Sasseur is a China-focused REIT offering investors the opportunity to gain exposure to a portfolio of income-producing commercial real estate assets in China. SGX also lists nine other REITS that provide investors with exposure to a diversified portfolio of retail real estate assets. The table below details the nine retail REITS as categorised by the Global Industry Classification Standard (GICS®) on SGX, sorted by market capitalisation. These nine trusts have a combined market capitalisation of S$21.4 billion. With the listing of Sasseur REIT, Singapore Exchange has a total of 43 REITs and property trusts with a combined market capitalisation of S$88.5 billion and an average price-to-book (P/B) ratio of 1.0x. The 43 REITs and property trusts average a dividend yield of 6.0%. Including Sasseur REIT, there are now 10 Retail REITs (as categorised by GICS®), which make up 23% of the REITs and property trusts listed on SGX. The 10 retail trusts have a combined market capitalisation of S$22.8 billion and average a dividend yield of 6.7% (after including Sasseur REIT’s projected dividend yield of 7.5% for the 2018 forecast period). Exposure to China’s fast-expanding retail sector – The growing middle-class population in China, together with the increased spending power, offers a large potential customer base for the outlet mall industry. Sasseur REIT believes the outlet mall industry tends to exhibit counter-cyclical behavior and resilience during economic recessions. Strong growth potential – Sasseur REIT believes it will benefit from potential acquisitions in China where its sponsor has an active mall presence. 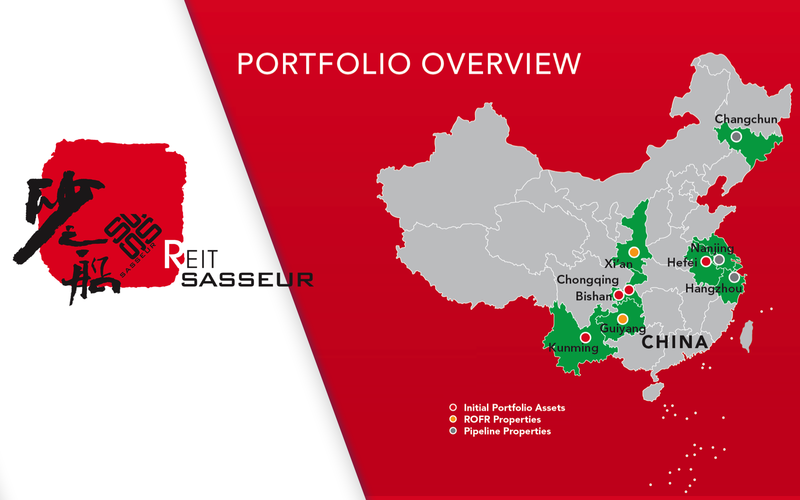 Strategically located portfolio in fast-growing cities – Sasseur REIT believes it has the first-mover advantage in fast-growing Chinese cities, including Chongqing, Kunming and Hefei, where its properties are located. Active asset management and asset enhancement – Sasseur REIT intends to proactively manage its property portfolio to achieve revenue growth and maintain optimal occupancy levels. Acquisition growth – Sasseur REIT hopes to achieve portfolio growth by pursuing selective acquisition opportunities of quality income-producing properties for retail mall purposes. Divestment – Sasseur REIT hopes to realise optimal market potential through divestment when suitable market opportunities arise. Capital and risk management – Sasseur REIT will employ an appropriate mix of debt and equity to finance its plans and strategies, as well as employ hedging methods to manage interest rate volatility and foreign income exposure. As Sasseur Shanghai is the Entrusted Manager of all of the properties in the initial portfolio, Sasseur REIT will be dependent on Sasseur Shanghai for its income. The Hefei PRC Property Company and the Kunming PRC Property Company may be exposed to potential liability and/or forfeiture of land arising from its non-compliance with the terms of the Land Use Right Grant Contracts. The loss of a significant number of tenants, key tenants or a downturn in the financial conditions may adversely affect the REIT’s financial conditions, operations and capital growth. Possibility of being adversely impacted by economic and real estate market conditions; changes in regulatory, fiscal and other governmental policies in China and Asia. Risks associated with exchange rate fluctuations and changes in foreign exchange regulations. Possibility of extensive PRC regulatory control on foreign investment in the real estate sector in future. According to the unaudited pro forma financial statements, Entrusted Management Agreement (EMA) rental income of the properties grew 48.7% YoY to S$91.2 million for the nine months ended 30 Sep 2017. The growth in the rental income was due to rent contribution from Hefei Outlets and Kunming Outlets, which opened in 2016. The total return attributable to unitholders for 9M2017 was S$47.0 million, up about 2.2x from S$14.6 million for the same period in 2016. The REIT has a distribution policy to distribute 100% of the distributable income to unitholders for the period from the listing date to 31 Dec 2019. Thereafter, the REIT will distribute at least 90% of the distributable income to unitholders from FY2020 onwards. Sasseur REIT has a projected distribution yield of 7.5% for forecast period 2018 (1 Mar 2018 to 31 Dec 2018) and 7.8% for FY 2019 (1 Jan 2019 to 31 Dec 2019). Hefei Outlets – Target middle class consumers by offering entertainment and leisure choices together with luxury brands. After redemption, the market capitalization is S$944.2 million. Cornerstone investors have entered into a conditional subscription agreement to subscribe for an aggregate of 228,437,500 units at the offer price. The cornerstone investors are: Adroit Ideology, Bangkok Life Assurance Pcl, CKK Holdings, Credit Suisse AG, DBS Bank, DBS Vickers Securities (on behalf of certain of its customers), Entrepolis, Great Achievement and Success, Haitong International Financial Products (Singapore), Secoo Holding, Sparkling Gateway and TMB Asset Management Company. (For more information, please refer to page 135 of the Prospectus). An option granted by the unit lender to the joint bookrunners and underwriters to purchase from the unit lender up to an aggregate of 32,000,000 Units at the offer price, solely to cover the over-allotment of units (if any).